Over the last few days, an estimated 350 people have been killed and 800,000 displaced in the worst flooding to hit the Indian state of Kerala for over a century. Thousands remain marooned by unusually intense monsoon rains. Between June 1 and August 17, the southern state has already received 2,305 mm of rainfall, which over 40% higher than normal. The country’s Airforce and Navy are still searching for people stranded on rooftops. 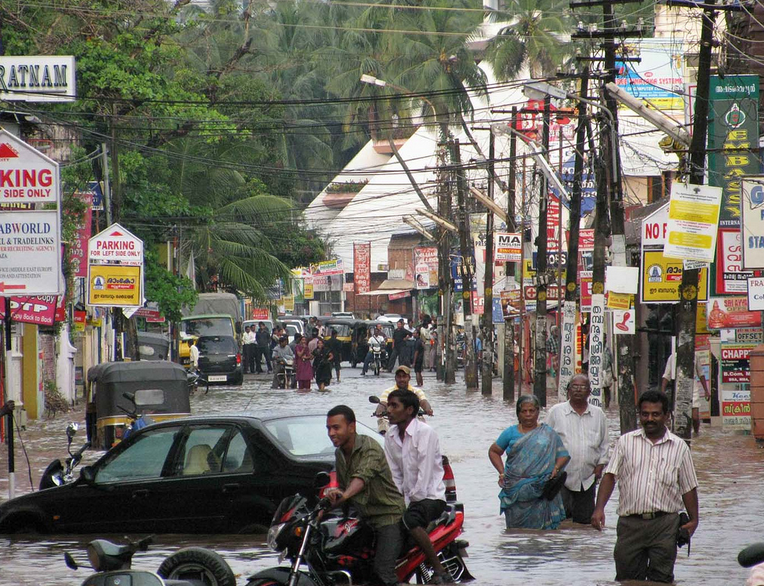 In the town of Chengannur an estimated 5,000 could be trapped. Hopefully the waters are set to recede over the next few days, although the authorities are concerned that there could be an outbreak of water-borne and other diseases. So far the floods are reported to have cost over $2 billion in damage, although this is widely expected to increase. Local and international experts are warning that the intensity of the Monsoon rains is another impact of our changing climate: A study in Nature last year concluded that there has been a threefold increase in widespread extreme rain events over central India during 1950–2015. During that period, there have been 268 reported flooding events in the country affecting about 825 million people, leaving 17 million homeless and killing about 69,000 people. 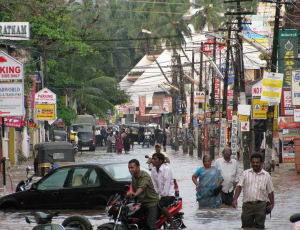 The increasing flooding “appears to be linked to the rapid surface warming in the northern Arabian Sea and the adjacent northwest India and Pakistan, which emerge as the largest ocean and land surface trends in the South Asian domain,” according to Nature.